Welcome to your Recalibration Reading this cycle. Thank you for joining me. This is your place to recieve clarity, spiritual guidance and soul nourishment for the coming cycle. Spiritual Guidance helps us reconnect with our soul and spirit, shows us where we need to let go, or break free of limiting behaviours and attitudes, gently reflects ourselves back to us to deepen self realisation, identifies issues to be healed, identifies blocks to be removed, helps us discern our direction, and gives us hope and clarity, as well as serving as validation we are on the right track. This reading can be taken as a whole, or you can just take the parts you need. Choose which card or item draws you in from the above picture. The card or item you resonate most highly with has a special message pertinent to your life right now. If you are drawn to more than one that’s ok. It means there are mulitple messages for you from the universe right now. Let your intuition guide you. Remember there is no wrong way to pick your card or item. We all have a divine link to the universe, and by reading this you are deepening your own divine link. #1. First Light Flower Essences card with Clear Quartz Crystal. Be self-assured and relaxed. You are strong and capable. Believe in yourself and your ability to succeed. Welcome new opportunities and career advancement. You’re ready for the next step, even if it doesn’t quite feel like it. Embrace the sense of achievement and joy that come from working optimally. Listen to the signs your body and mind give you when you are over worked and take care of yourself to avoid burn out. Remember a good leader knows how to delegate. Let go of the stress about how others perceive your success or status and embrace your personal authority. Let go of workaholic tendencies and excessive blind ambition. Especially when they are negatively impacting your personal life, or you are using work to escape from being lonely. 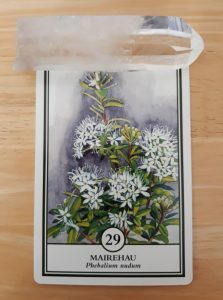 If you’re feeling overwhelmed by the amount of stuff on your to do list and can’t switch off, or you’ve been experiencing anxiety about meeting responsibilities, being a success in the world, or achieving your goals, working with the First Light Flower Essence #29 Mairehau will be of much benefit for you at this time. From the First Light Flower Essences of New Zealand cards 1-84 and The Sacred Plant Medicine of Aotearoa. #2. Fairy Oracle of the Patupaiarehe card with Bell. The time has come for self-care & self-transformation. You are ready to step up to a new level in your life. You may not feel ready, however this card indicates you are. Honour the essence of who you are and the treasures you have brought in from your ancestors, both physical and spiritual. It’s time to reflect on life, figure out what means the most to you, and positively transform yourself on all levels. Let go of what no longer serves you to make way for the new. Tear down non-serving structures and beliefs. A time of shedding and elimination brings closure and completion. Your powerful connection with the ancestors and your ability to take the lessons from your experiences and shed the rest will see you well on your journey. Give thanks for your natural gifts then share them as you see fit. 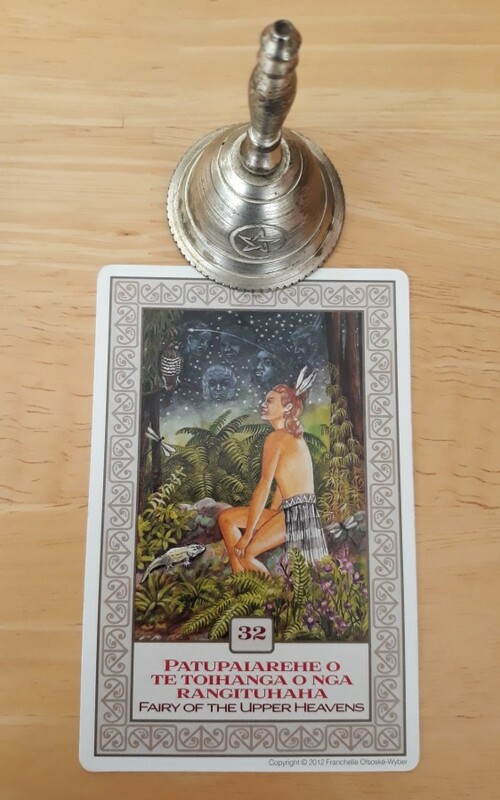 From Franchelle Ofsoske-Wyber’s The Fairy Oracle of the Patupaiarehe Oracle Cards. #3. 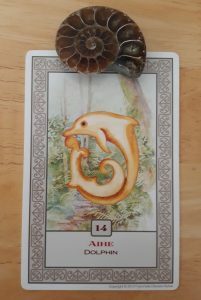 Fairy Oracle of the Patupaiarehe card with Shell Fossil. This is a time of hope, happiness and wishes coming true. Be playful, have fun and be spontaneous and enthusiastic. Embrace your senses, but remember to express your emotions appropriately. Open your heart to the harmony and perfection available to you now. It’s time to leave the shadows of the past behind and receive all the abundant gifts the universe has for you. Dance to the joyous song in your soul you beautiful free spirit. You are a physical being, but you are also a metaphysical being too so remember to honour that by knowing you are a spirit having a physical journey. Take comfort that your wishes are being fulfilled. Express your natural exuberance and joy. The law of attraction is on your side. Jump for joy! #4. 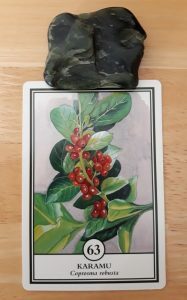 First Light Flower Essences card with Pounamu/NZ Greenstone. You have the power to manifest all that you need in your life. 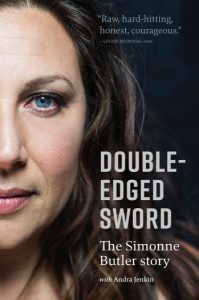 You will succeed by taking charge, applying direct focused action to your dreams, aspirations and goals, and using your unique gifts deliberately and purposefully. Watch where your thoughts go as our thoughts become our reality. Believe in yourself and your abilities, decide to be all you can be, and don’t settle for anything less than you deserve. Remember you have everything you need inside you to cope with any and all situations and tasks. If you’ve been feeling ineffectual, overwhelmed by life, or scattered lately, it’s time to slow down, re-evaluate your direction, and re-focus your intentions. You have the ability find intelligent solutions and multi task effectively right now. There is still untapped potential in you and you are capable of achieving your wildest dreams. Stay in the moment and believe in yourself. See yourself as the talented magician or artist who can turn your dreams into tangible reality. Focus your intention and the world is your oyster. Be the master magician of your own life and create the life you desire. Working with the First Light Flower Essence #63 Karamu will be of much benefit to you at this time. 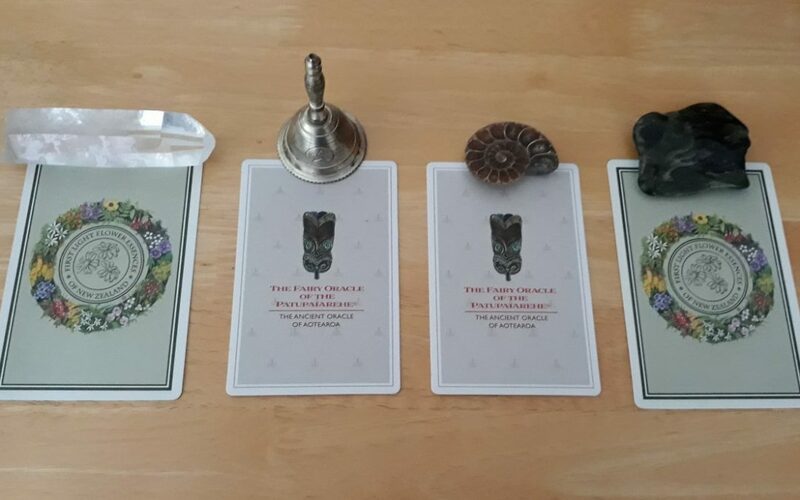 From the First Light Flower Essences of New Zealand card pack 1-84 and The Sacred Plant Medicine of Aotearoa. Recalibration Reading – Achievement. Positivity. Joy. Manifestation. As a whole this reading is about stepping up to the next level and manifesting and achieving everything you need to lead a successful magical joyous life. The power is yours. It’s always been yours. Get out of your own way. Eliminate the outworn and step up. You are magic after all. Make a wish. Focus on your dreams. Leave the past behind. Live in joy. Thank you so much for reading my reading.